The Miami Art League is a unique local studio for artists and aspiring artists looking for an intimate setting in which to do creative visual arts – with or without instruction. On February 28th, The League features K.D.Tobin, a Golden Certified Working Artist for a FREE lecture/demo, “A to Z Acrylic Paint & More”. MAL was founded in 1930 by 12 Artists; included among them were Louise Zaring who studied in Europe with her friends Degas, Garrido and Renoir; and Carl Folke Sahlin, the famed Swedish painter. The Rickie Report introduces our readers to this artist networking organization located in Miami Shores, FL. There is Free Parking behind the studio. We share the Class Descriptions and times here. Please RSVP for the Demo/Lecture. The Miami Art League is conveniently located at 9709 NE 2nd Avenue. 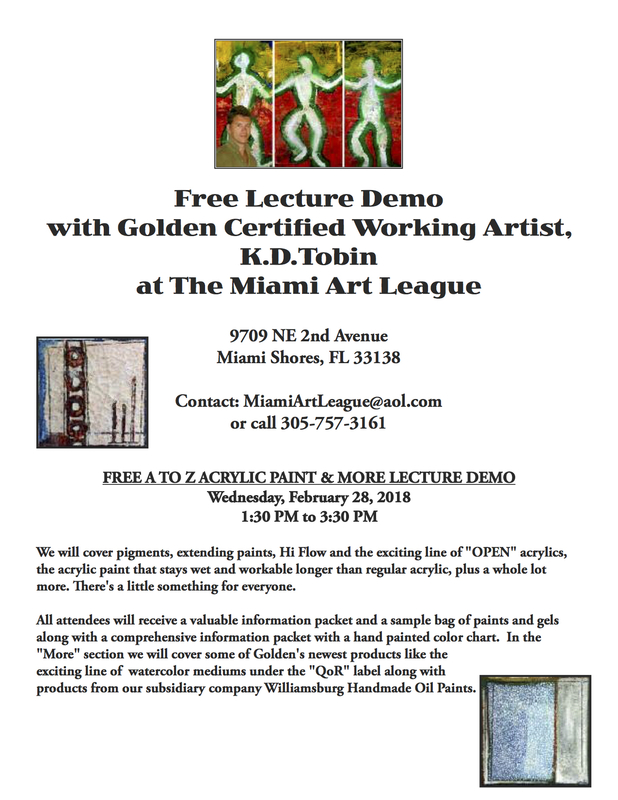 The Miami Art League will host a Free Demo at the League on February 28th, 1:30 – 3:30 with Golden Certified Working Artist Kevin Tobin, www.kdtobinart.com. This is a great way to learn about new materials and techniques, receive free materials and meet the folks at the Miami Art League. Please join us. RSVP by calling 305-757-3161. You can follow the activities of the Miami Art League on FB at Miami Art League, check on the web at www.MiamiArtLeague.com or leave a message at 305-757-3161 or MiamiArtLeague@aol.com and an Artist will respond with more information. In addition, there are Open Studio sessions during the week for Members who wish to work on their own projects without instruction. Artists work in their own medium at easels provided by MAL Studio. 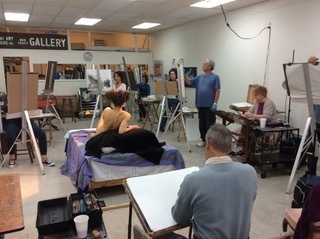 Classes are held in the Studio each day between 9:30am and 1pm Monday through Saturday. This is your opportunity to stop by to view the studio or try a class! 2018 will bring extended programming including additional evening and Sunday classes. This studio was founded in 1930 by 12 Artists; included among them were Louise Zaring who studied in Europe with her friends Degas, Garrido and Renoir; and Carl Folke Sahlin , the famed Swedish painter. The expertise and camaraderie continues into today’s world as the Miami Art League recently honored long time local watercolorist Ruth Karp, NWS, FWS for her 50+ years of painting and acclaim. Donations in honor of Ruth were utilized to begin the first Miami Art League Scholarship fund to aid talented teens to pursue their path through the art field. In addition to being a welcoming and inspiring place to paint, Benefits of Membership include: on-site easels and drawing boards, individual cubbies for personal supplies, racks for drying paintings, free parking, coffee and snacks and a place to call home with friendly co-Members. 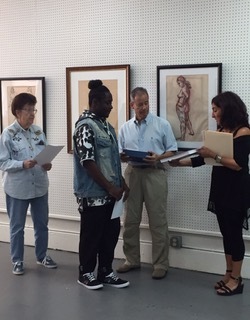 Presentation of Scholarship: Left to right: Ruth Karp,NWS, FWS; Scholarship Recipient Adrian; Raymond Dranoff President Miami Art League; Linda Wolk Winters, MAL Community Co-ordinator. Members also participate in Miami Art League Themed Exhibitions and, on a rotating basis, exhibit their work in the storefront bay window facing NE 2nd Avenue. Annual Membership runs from January – December and is $150, $75 for students. Individual classes are kept at $15 – $35 modest fees, to include artists of all ages and abilities to participate. There are also $5 Open Studio times when Artists may work on their own projects. As a 501c3 nonprofit educational organization, the Miami Art League is proud of creating space for all members of the community, acknowledging that art is a key to creating a meaningful life – for all ages. 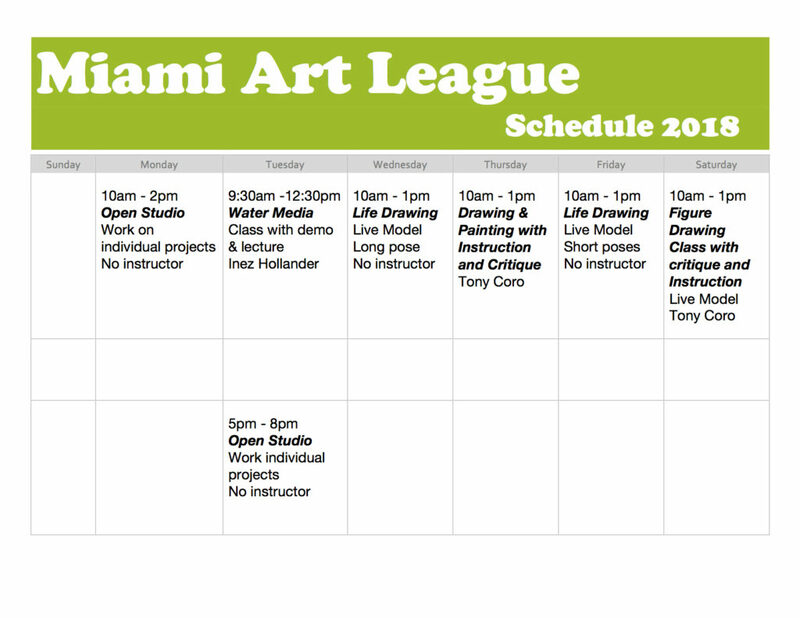 The Miami Art League provides a variety of classes including Life Drawing, Opening Painting and sessions with and without instructors. On February 28th, The League features K.D.Tobin, a Golden Certified Working Artist for a FREE lecture/demo, “A to Z Acrylic Paint & More”. The Rickie Report introduces our readers to this artist networking organization located in Miami Shores, FL. There is Free Parking behind the studio. We share the Class Descriptions and times here. Please RSVP for the Demo/Lecture. An innovative approach to acrylic and watercolor painting… Free the eye, the hand and the heart through an exploration of water based media (watercolor or acrylic paint). Discover the wonderful paintings you can create. Use watercolor, acrylic paint, crayon, ink, chalk and/or collage to expand painting skills in color, composition, and design. In this Open Class students work on their own projects under the guidance of Tony Coro. Students work either with Drawing or Painting, depending on their interest. The class culminates with a critique of the class work.